Our virtual MSP Practitioner course offers the experience of a classroom environment but from the comfort of your own home — teaching you how to deliver transformational change in your organisation, through multiple projects in a programme. 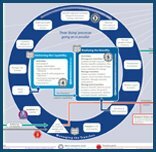 The Managing Successful Programmes (MSP) guidance explains the programme management principles, governance themes and transformational flow that should be applied to the management of programmes or transformational change in any environment. The purpose of the Practitioner qualification is to determine whether you have sufficient knowledge and understanding of the MSP guidance to apply it to your own work and, therefore act as an informed member of a programme management team — someone responsible for managing, leading, supporting or advising on work within an MSP environment. This is an intensive two-day course that prepares you for the MSP Practitioner examination. The training is conducted via a virtual training environment. You need to ensure that you can satisfy the technical requirements that can be found on our website. In addition, whilst attending your course, there will also be some examination preparation evening work. You must pass Foundation prior to taking the Practitioner examination. You will require a copy of the official MSP manual for the MSP Practitioner course and exam. This is not included in the cost of the course. Should you wish to purchase the manual you can add it to your shopping cart once you have selected your chosen date.